Foundation, brushes, Eyeliner, eye shadow, false eyelashes, primer, concealer, green concealer... What the hell is green concealer? Why would you want to paint your face green? I love watching the tortured look on my friend’s face as we walk up and down the cosmetics isle in Myer. It may seem juvenile to bring her here just to see her squirm uncomfortably (considering she, like many girls I socialise with, wear chap stick as lipstick) but a girl’s gotta her kicks where she can. Rarely, do I get the opportunity to bring a woman (who would most probably prefer to be in the hardware section, than the cosmetic section) shopping for makeup supplies, but this is the bonus of being a makeup artist and a fellow lesbian lover. I get to make my friends uncomfortable, get them into the makeup department and give them the occasional make over, in exchange for perhaps, being introduced to the cute girl I saw on her Facebook page. It occurs to me that perhaps my friend is not the only woman out there, staring at the green concealer with a terrified look on her face, pulling her hair out. So here’s the introduction to my survival guide to the cosmetics section... everything from what you need and why, to how to apply you products according to your features in a way that even my friend who operates a 385C L Hydraulic Excavator in the South Australia could understand. Fingers! Your fingers are your most useful tool. Skilful fingers are handy for all manner of things, including application of concealer, eye primer, lip balm and gloss, caressing you girlfriend’s face... the list goes on... so don’t discount your fingers ladies... embrace them, utilize them, just keep them well-manicured. 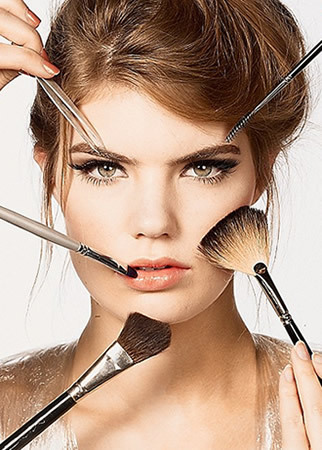 Foundation Brush: So, to apply your foundation, you can use your fingers, but to achieve that flawless foundation application, you want to use this brush. It creates a polished look with full coverage, and it looks like a paint brush, so the artist in me loves it. Large Powder Brush: This brush, is big and fluffy, I use this brush for applying loose powder and also to buff harsh lines from blush/bronzer or for just running over your face because it feels divine. Angled Contour Brush: Ever wondered how super models get those angles cheek bones and chiselled facial features? With this brush (and the right colour contour of course) The slanted brush mimics the angles of the cheekbones for defining, highlighting and contouring, giving you cheek bones where you had none. Eye shadow Brush: Pretty self-explanatory, I would have two sizes a large and medium or small brush for definition. This rounded, double- chiselled, paddle-shaped brush is perfect for applying and blending Eye Shadow. Angled Liner Brush: If you’re new to liquid eyeliner, then this is the bush you want! It’s thin, easily handled and the angle makes it so much simpler to apply. Concealer Brush: this brush is flat brush with slight pointed tip for precision application to hide those problem lumps, bumps and scarring. Lip Brush: You want the rounded lip brush, it’s perfect for controlled lipstick application and most come with a metal cover to stop excess lippy getting everywhere. - Don’t skimp on the quality, good quality brushes, not only feel amazing on your skin but they will grip the products better and all in all be better for application. - The fibres of your brush are also important, animal fibres, such as goat hair are usually the best, but as a vegan, I have found many high quality synthetic fibre brushes on the market too. MAC Cosmetics and Furless Cosmetics would be my best pick. In the next issue, I will discuss products, which ones you need, which you don’t and what the hell you’re supposed to do with them.